Every Sunday the Riviera is populated by a crowd of characteristic local merchants. 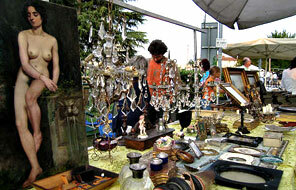 In particular, at Isola Bassa, the old part of the town of Dolo, there is an interesting Antiques market every fourth Sunday of the month. These places so fascinated Canaletto, that he made them the subject of one of his famous paintings in 1728.